The Emerson Bromo-Seltzer Tower is a historical landmark that was designed by Joseph Evans Sperry and built by Captain Isaac Emerson. The tower was built in 1911 and was the tallest building in Baltimore at the time. The building features four clock faces made of translucent white glass and features the letters “B-R-O-M-O-S-E-L-T-Z-E-R” to represent each hour. Today, the tower is used as studio space for visual and literary artists. 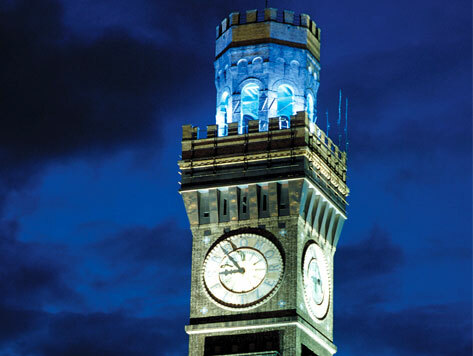 Bromo Seltzer Arts Tower is located on the cornerstone of Baltimore’s Bromo Arts District. Within blocks from the building are the Hippodrome Theatre, Royal Farms Arena, Oriole Park at Camden Yards, and M&T Bank Stadium.